Microzooplankton grazing activity in the Celtic Sea and Carmarthen Bay in summer 1983 and autumn 1984 was investigated by applying a dilution technique to high-performance liquid chromatographic (HPLC) analysis of photosynthetic pigments in phytoplankton present within natural microplankton communities. Specific grazing rates on phytoplankton, as measured by the utilisation of chlorophyll a, were high and varied seasonally. In surface waters during the autumn, grazing varied between 0.4 d-1 in the bay and 1.0 d-1 in the Celtic Sea, indicating that 30 and 65% of the algal standing stocks, respectively, were grazed daily. Grazing rates by microzooplankton within the thermocline in summer suggest that 13 to 42% of the crop was grazed each day. 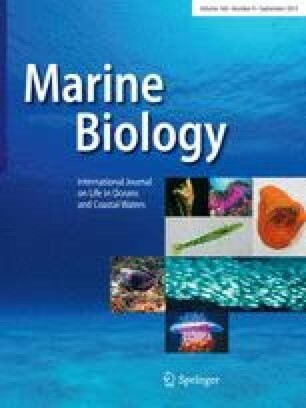 Microzooplankton showed selection for algae containing chlorophyll b, in spite of a predominance of chlorophyll c within the phytoplankton community. Changes in taxon-specific carotenoids indicated strong selection for peridinin, lutein and alloxanthin and selection against fucoxanthin and diadinoxanthin. This indicates a trophic preference by microzooplankton for dinoflagellates, cryptophytes, chlorophytes and prasinophytes and selection against diatoms, even when the latter group forms the largest crop within the phytoplankton. Interestingly, those algal taxa preferentially grazed also showed the highest specific growth-rates, suggesting a dynamic feed-back between microzooplankton and phytoplankton. Conversion of grazing rates on each pigment into chlorophyll a equivalents suggests firstly, that in only one experiment could all the grazed chlorophyll a be accounted for by the attrition of other chlorophylls and carotenoids, and secondly that in spite of negative selection, a greater mass of diatoms could be grazed by microzooplankton than any other algal taxon. The former may be due either to a fundamental difference in the break-down rates of chlorophyll a compared to other pigments, or to cyanobacteria forming a significant food source for microzooplankton. In either case, chlorophyll a is considered to be a good measure of grazing activity by microzooplankton.